This is Kumanoko. He is a syrian hamster like me. He's even the same color! His Mama has a website with many of his photos. Kumanoko has a problem with his teeth. He only had two: one in the top and one in the bottom of his mouth. The top one wasn't growing straight and he had to visit the doctor every month to clip it. Because of that problem he has had surgery to remove it. His Mama says that he's recovering now. Please visit his website and leave him a comment telling him to get well soon! 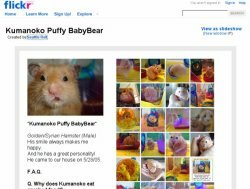 aww...poor kumanoko..at least he's alive.he must be a nice hamster like you. I saw your comment on Kumanoko's photoset. I'll be able to upload his new photos very soon. I was checking your website also. You guys were *great* parents for Baruchito! hehhe.. awww... nana.. does someone have a crush..? That is one cute hammi! I love it. Get well soon. We want to see Nana and Luna Photos on Flickr too :) Please consider opening an account, Juri! Awww!!! Kumanoko is such a cutie!! So sorry to hear about his teeth. Poor baby, I hope he will be all right. my syrian teddy bear hamster named Peaches. nana,do you ''like''kumanoko?i hope he gets better soon!he is such a cutie! This is Seattle Roll again. Please consider to upload Nana and Luna Pictures on Flickr. I really think your pictures of Hamsters are cute.